For the Meatballs: preheat oven to 400ºF. Line a baking sheet with parchment paper. In a medium sauté pan over medium-high heat, add olive oil, onion and garlic, cook until soft and translucent., about 3 minutes. Remove from heat and set aside. In a large bowl, add onions, garlic, pecan meal, bread crumbs, dried oregano, flat leaf parsley, mozzarella, parmesan, eggs, hot pepper flakes, salt and pepper. Using your hands mix to combine. Form into golf ball sized balls and place on parchment lined baking sheet. Bake in oven for 20-25 minutes. Remove from oven and transfer to cooked tomato sauce, let simmer for 5-10 minutes. For the Tomato Sauce: in a medium Dutch oven over medium high heat, add olive oil, onions and garlic, cook until soft and translucent, about 3 minutes. Add the crushed tomatoes, and season with salt and pepper. Simmer for 15-20 minutes. Bring a large pot of salted water to a boil. Add the spaghetti, cook according to package directions. Drain pasta and serve with pecan meatballs and tomato sauce. 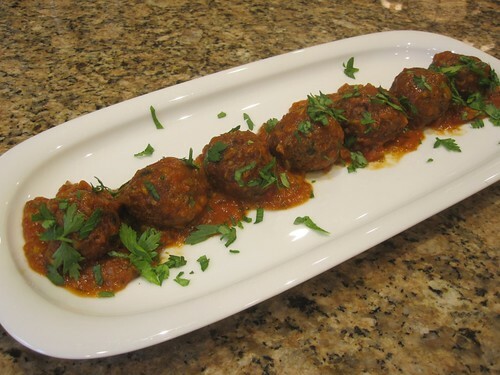 – After making the pecan meatballs, freeze the extra until ready to use! – Instead of pecan meal, use almond meal! I used my own vegetable pasta sauce that was already made. I love these and you don’t miss the meat. Hi Ellen, these are such a huge hit here, my vegetarian friends love them, my husband and brother couldn’t tell they weren’t meat. Hope you enjoy them as much as we do.